God Can Only Be Experienced Through Faith! God is spirit and the spirit of truth is within you. God is an experience and experience is the best teacher. It is our feeling (awareness, inner knowledge) that’s the secret. The bible teaches, it is impossible to know God or experience God (Imagination) without faith, for the just must live by faith. God can only be experienced through faith. Faith is believing and knowing, that what we have experienced in our imagination we must experience in our physical world or reality. 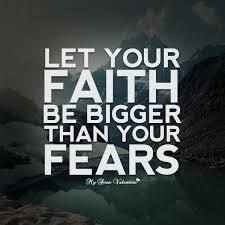 Fear is the oppossite of Faith. Always focus on love through faith by always imagining the best in everything. For the kingdom of heaven (eternal life or state of bliss) is within us. We are spiritual beings having a human experience and Imagination is our power within and Imagination is also our mirror within, reflecting back to us our inner visions (Our thoughts and images are things we experience within). We become what we think about or imagine all day long. Imagination is God, Imagination is experience. All our experiences is a result of all our imagining. imagining creates reality and Imagination is reality. God (Imagination) can only be experienced through faith by living through faith and not by sight. Living through faith proves you trust in God (Imagination). because it is impossible to experience God or know God without faith. For God is love and love is the infinite truth. Love is an experience and love is an attitude of heart. Imagination is God and God can only be experienced through faith! ← Belief Is Everything And You Will Only Experience What You Believe!